Compared to Facebook users, it seems like the people of Twitter-verse have a whole different opinion on Presidential Communications Operations Office (PCOO) Asst. Secretary Mocha Uson. In fact, a viral parody account of Uson, called @AsecMargauxUson, has been trending on Twitter for quite some time now. 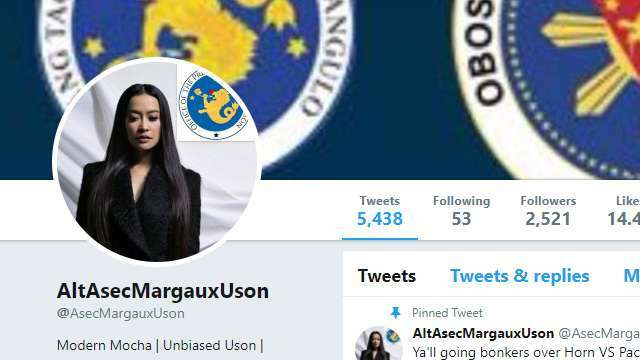 The @AsecMargauxUson account, according to its description, is the “Modern Mocha” and “Unbiased Uson” version of the popular personality. This parody page, which was established June this year, is best known for its controversial threads and funny memes. As of writing, it has 5,000 tweets and counting. Here are some of the most hilarious and most savage tweets and memes of the said account (so far). The admin of this account has good eyes! Who needs Uber and Grab when you have a chopper service? She’s good at keeping receipts, too! Aside from this alternate Uson account, there are other witty paradoy accounts that you should follow, too—that is, if you want to read regular #burns on your feed. Follow at your own risk: @AltTeamAFP, @PropagandistCom, and @AltMalacanang!